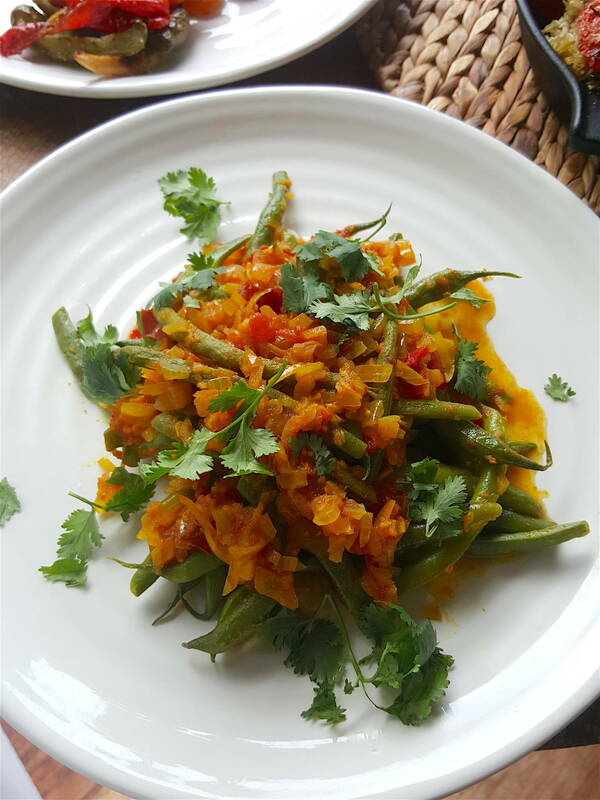 Green Beans with Ginger & Turmeric – spice up your dinner! These beans should end up fork-tender, not hard and crunchy, so they absorb all the spicy flavours. 1 Plunge beans into a saucepan of gently boiling salted water and cook for 5 minutes or so, until fork-tender. Drain and refresh with cold water. 2 Wipe out pan, add vegetable oil and heat briefly, then add onion. Cook for about 7 minutes over gentle heat, until tender but not coloured. Add garlic and ginger and stir-fry for 1 minute, then add turmeric and chilli powder and ½ a teaspoon salt and cook for 1 minute more. Add tomato and water, bring to a gentle bubble, and cook gently for 10 minutes. 3 Return beans to pan and cook gently for 5 minutes more. Stir through coriander and serve.